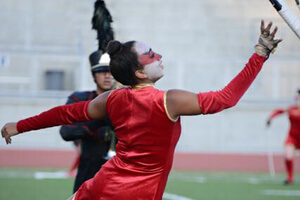 Open Class: Brass: Gold (13.9), June 29, Walnut, CA Percussion: Gold (16.0), June 28, Oceanside, CA Color Guard: Gold (13.4), June 30, Riverside, CA View all scores and recaps. Storylines to watch • Competition has been extremely tight between the Blue Stars, Crossmen and Troopers. On June 29, the three corps scored within two tenths of a point of one another, with Crossmen (68.40) in third, Blue Stars (68.30) in fourth, and Troopers (68.20) in fifth. Placements reversed the next day in Rochester, Minn., with Blue Stars (70.50) taking second, Crossmen (70.30) in third, and Troopers (68.30) in fourth, this time all within 1.7 points of each other. Earlier in the week, on June 26 in Evansville, Ind., Troopers (68.625) led the three, finishing third, followed by Crossmen (67.75) in fourth, and Blue Stars (67.00) in fifth. • As Carolina Crown wraps up its first-ever early-season tour of the West Coast, the South Carolina corps continues to run neck-and-neck with the defending World Champion Blue Devils. Crown now holds a 3-2 lead, though in all five of those head-to-head meetings, the scoring gap between the two corps has been less than a point. Crown and Blue Devils will next square off July 3 in Ogden, Utah. • Carolina Crown became the first corps to break 80 points in total score this season, doing so with an 80.05 on June 28 in Oceanside, Calif. The Blue Devils followed suit the next day in Walnut, Calif. with a score of 80.90. The Cadets are on the precipice of breaking 80 points themselves, scoring 79.70 on June 30 in New Haven, Conn. • Carolina Crown passed 80 points a full five days earlier than in 2012. The Blue Devils did so two days earlier this summer versus last. • A handful of open Open Class corps were in action this week on the DCI Tour. Gold won three competitions in the West, including Oceanside, Calif. (69.85), Walnut, Calif. (68.50), and Riverside, Calif. (68.30), facing Impulse and City Sound in those events. In the East, Spartans marched to a strong start, winning in Quincy, Mass. (68.30) and New Haven, Conn. (68.90) against 7th Regiment and Raiders. 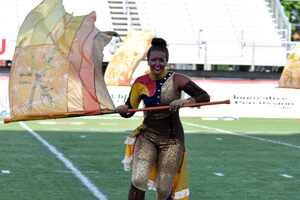 In the Midwest, Legends stayed ahead of Colt Cadets on June 30 in Salem, Wis. • Earlier in the week, on June 24, in Santa Clara, Calif., Blue Devils B (65.20) and Vanguard Cadets (64.60), came in first and second once again, just eight tenths of a point away from one another. • With all World Class corps now competing, the Cadets are the only corps with the opportunity to pull off an undefeated season, having won all eight of the events the corps has appeared in so far this season. 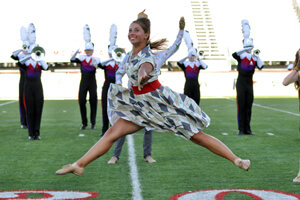 The Cadets will first meet the Blue Devils and Carolina Crown, the front-running corps in western competitions, next week on July 11 in Warrensburg, Mo. • Santa Clara Vanguard's percussion section has been on a tear, taking first in the percussion caption in every competitive event the corps has appeared in so far this summer. • While the Bluecoats bested Phantom Regiment in their first head-to-head meeting of the season on June 22 in Akron, Ohio by a miniscule five hundredths of a point, Phantom Regiment has been anywhere from 1.7 and 0.7 ahead of the Bluecoats in subsequent meetings. 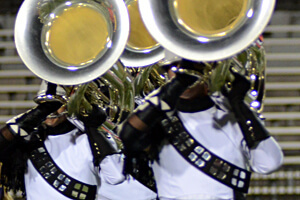 On June 30 in New Haven, Conn., Bluecoats were back within two tenths of a point from Phantom Regiment's score. • The Cavaliers have finished behind the Madison Scouts, Bluecoats and Phantom Regiment in all of their head-to-head meetings this summer, however the corps' score of 75.40 on June 30 in Salem, Wis., was ahead of Madison (74.40, Rochester, Minn.), Bluecoats (74.30, New Haven, Conn.) and Phantom Regiment (74.50, New Haven, Conn.) on the same day though in different competitions.